I've been working on a larger piece that will be available soon through Sebastian Foster gallery and was inspired to revisit some other themes in my work that I hadn't painted in some time. 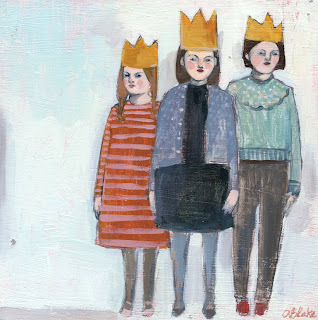 Not sure what it is exactly about a trio of girls but it's an image I've returned to again and again and crowns just always make everything better. I recently decided to switch my online shops around and have moved almost everything back to etsy. This makes it easier for me - managing just one shop. And I hope works great for everyone else - two of the immediate improvements are you can check out with or without paypal and I can accept etsy gift cards. If you are in the Seattle area I have three paintings in the POP UP arts night at the Bright gallery on December 8th - a fundraiser in support of Pacific Crest school. I'm still adding new prints in my shop - limited and open edition. Many in sizes that are ready for standard frames - prices range from $20 - $95. If there is an painting you had been hoping I'd make a print of let me know and I just might be able to add it to the shop.